Making the world more sustainable requires cooperation. If you do not want to “go it alone” you will need to involve other stakeholders in your processes. But how do you approach stakeholders? How do you get their attention and their interest? And, how do you get them to co-invest in your ideas and plans? Except provides support, facilitation and analysis in all phases of stakeholder engagement. Involving stakeholders requires more than simply asking them their opinion or their wishes. It is an essential step to get ahead by gaining interest, gaining input for your strategy and adjust your direction. Working together works best if there is a shared vision, a common goal and interest. Cooperation starts by finding out and understanding all relevant issues at hand. Except performs in-depth stakeholder analysis and facilitates stakeholder involvement. Along the way we can develop, investigate and visualize creative solutions and facilitate events and workshops. With our network of experienced professionals we can partner on technical, creative, scientific and business intelligence, and offer experts on most related subjects for inspirational talks, workshops or consulting. Together we can build a shared vision and guide parties towards accelerated innovation and succesful implementation. Attract partners that share knowledge, contacts and partners that want to co-invest in the realization. How can stakeholders help you realize your dreams, goals or plans? And what role are they willing to play this process? What initiatives and which parties are of interest for participation programs in neighborhoods or buildings? What are effective programs for urban development that utilize the capabilities and talents present in the area? How can local parties and inhabitants help to improve the community while advancing the physical appearance and performance of your city? The world of stuff is changing: closed loops, supply chain interactions, restrictions on facilities and new market opportunities. How does it all affect your supply chain and what are the new parties to involve to live up to new standards of doing business? What are the relations between policy makers and civilians? How can policies increase the level of participation and influence sustainble development by using the capbilities that are already embedded in society? Do participation processes and stakeholder involvement lead to better and innovative results, or to unmanagable and messy expectations and outcomes? Do the current policies and working methodes support entrepreneurship and involvment? What is the different about modern policies that allow and enhance sustainble growth? Except's sustainability assessments stand out by their wide range, efficiency and insight, customized to your particular situation. We include stakeholders wherever we can, and include our clients in every step of the process. Except's custom developed Symbiosis in Development (SiD) methodology works on all layers of society, and assures a complete and thorough sustainability analysis. This is an important first step that enables you to present all relevant topics and relations that are of interest to the stakeholders. A focussed and well substantiated overview of goals and opportunities is the gateway to effective exchange of ideas and the selection of topics for cooperation or participation. SiD evaluates these aspects for both short and long term effects, as well as global versus local impacts. This include matters of climate adaptation, social justice, CO2, circular economies, transport, biodiversity and cultural value. In all meetings and sessions with stakeholders we use elements of SiD as a guideline for idea generation and concept development. SiD function is an insightful and helpful framework that enables all participants to understand the concept of sustainability and relate it to their strategical goals. 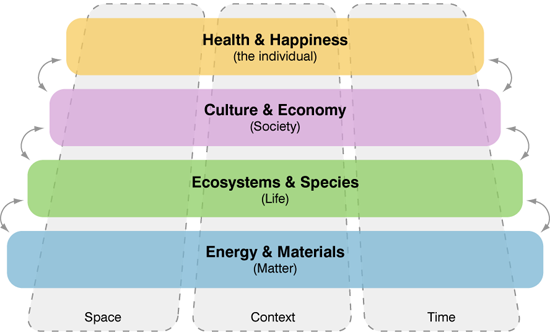 As SiD visualizes the relations between all sustainability aspects, stakeholders will be able to pinpoint exactly how and where they can contribute and be of value. Except guides the discussions and safeguard a solid approach to sustainability while facilitating the process, meetings and workshops. Contact us to talk about possibilities for tailored stakeholder approaches. Van het Zuiverste Water (translates in 'From the Purest Water') was a stakeholder trajectory led by Stadsstromen to help the Municipality of Almere futureproof their water management approach. Except was asked to assist during several meetings with expertise in illustration, design and stakeholder engagement.